Wrong. So very, very, wrong. But first… today was a big day. Not in that I did anything amazing, but my two presentations were scheduled at my conference. Both went pretty well. Big news was that I got a Outstanding Paper Award for my work with Daniela and Michael which was very nice. And no… it wasn’t like an encouragement award where everyone got one. Only 3 were handed out to the couple hundred papers. So virtual high fives all round. But that’s not what you come to my blog for. You want to know “so Matt… did you do something stupid today?”. And today, the answer is… yes. Yes, a burger. But a buffalo burger! Made from 100% authentic bison. Mmmm. It was pretty tasty too. 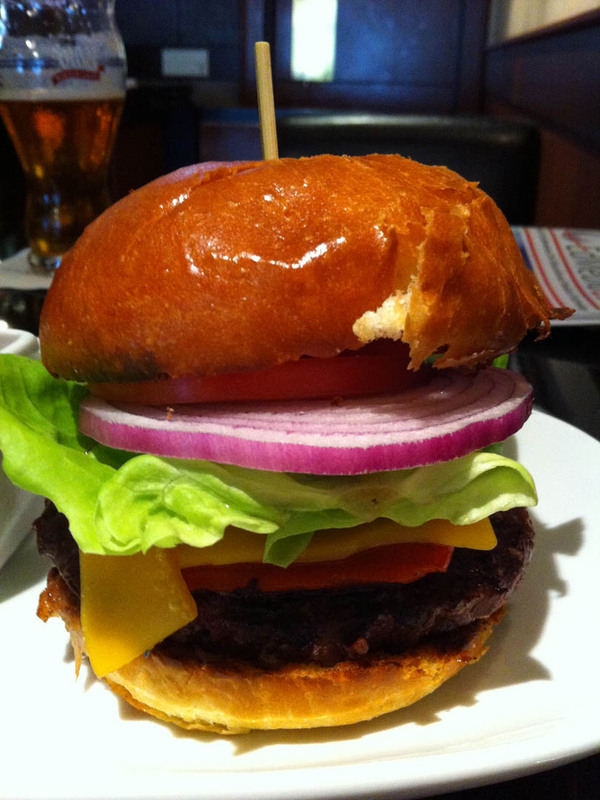 I expected the taste to be stronger (having eaten a moose burger in the past) but really, it was just pretty burgerish. Good though. So I thought that was going to be the extent of my evening. Maybe watch the ball on TV and try and get some early shut-eye. Then it dawned on me. 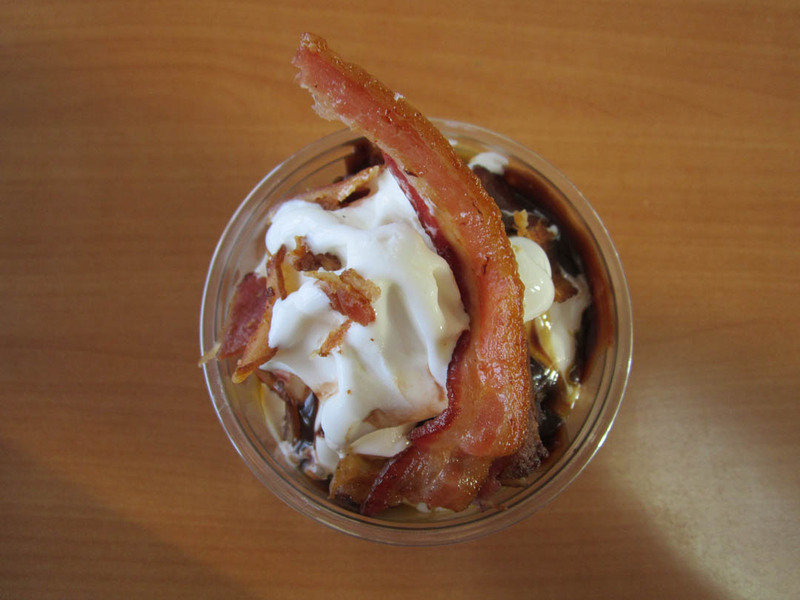 BACON SUNDAE. Yes. 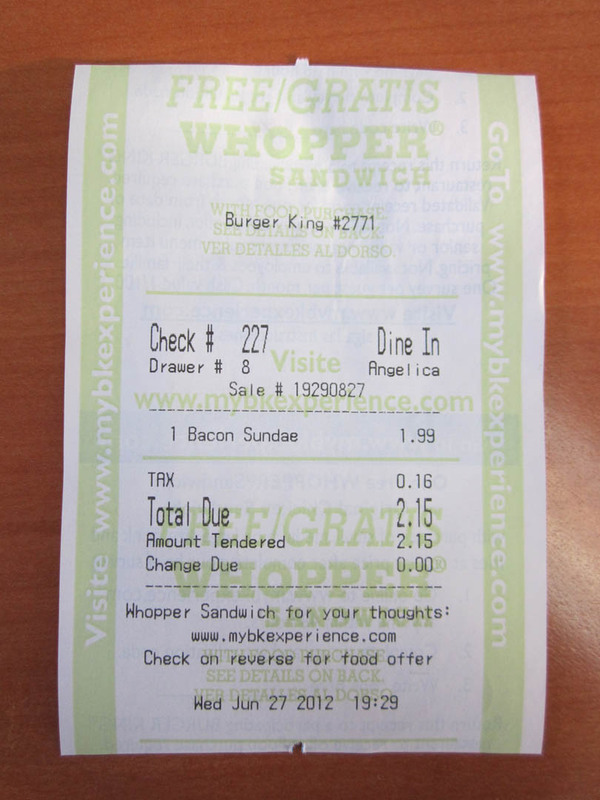 So off I legged it to Burger King. I gotta admit, I was getting pretty excited as I got there and opened the door. I could see the ice cream machine in action so I wasn’t going to be denied this time. 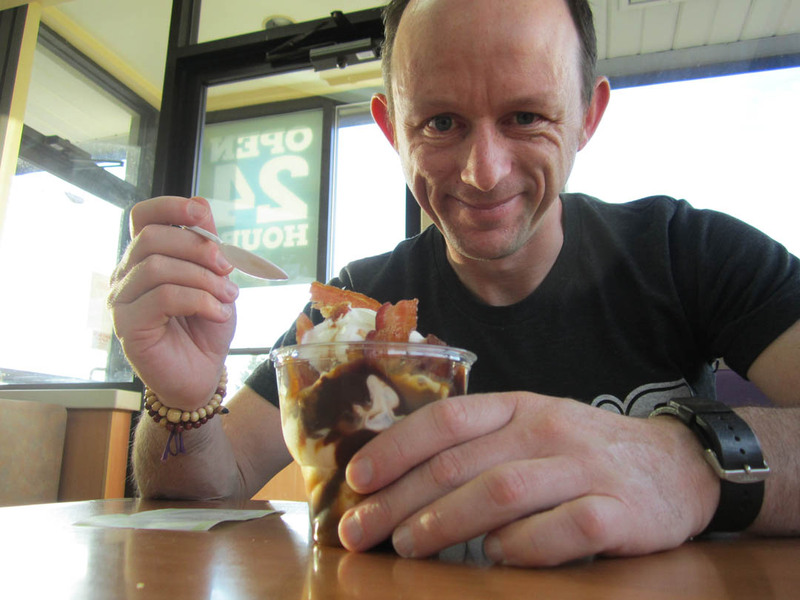 Take two… “One Bacon Sundae please!”. “That will be $2.15 thanks sir”. Over I handed my greenbacks and oh boy… the tension was palpable! YES. It looked exactly as I expected. Wrong, but oh so right all at once. Bacon bits on top, with a crispy rasher of bacon sticking out the top. What kind of demented genius came up with this?! First bite was interesting. It is the cold vanilla ice cream and the chocolate and caramel that hits first. I had a pang of disappointment when the bacon flavour didn’t hit. But once the ice cream started to disappear from my mouth then hit the bacon. And it was strange. In fact as I had a few more spoonfuls, it pains me to say it, but this sundae was wrong. So very, very, wrong. You know me and my love of bacon. But this sundae really has no right to exist. It’s not as if it was all some magical combination that someone freakishly discovered and had to share the taste explosion with the world (well the US anyway). It wasn’t like the salty of the bacon was the perfect foil to the sweet. The bacon just tasted, well, fatty. It is like some deranged lunatic (probably not dissimilar to myself) thought “Hey! 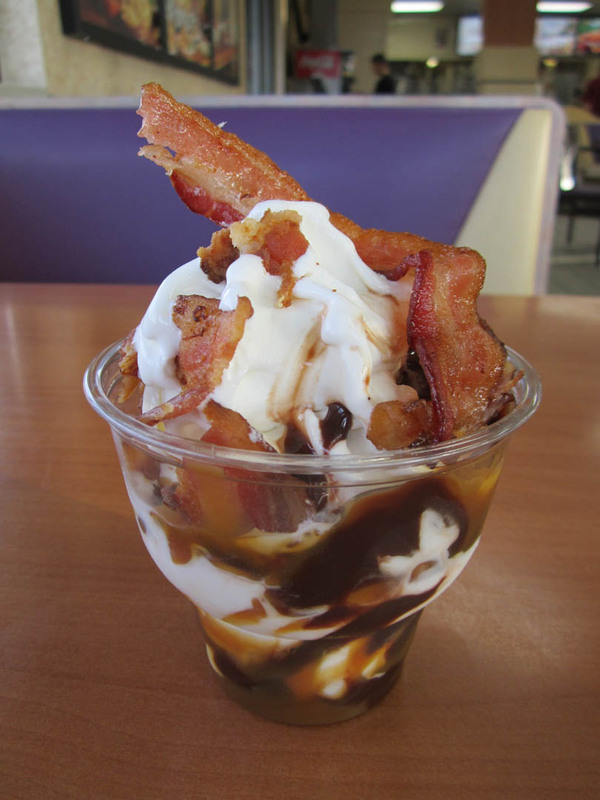 I wonder if we made a bacon sundae if any crazies would buy it?!”. Well the answer is yes. This one did. So did I finish it? Of course. Even eating the crispy bacon strip, all covered in melted ice cream, caramel, and chocolate. By that point my tastebuds were all messed up, so eating the strip didn’t seem any worse than the rest. So there you go folks. I regret nothing of course. I do this so that you guys don’t have to. It looks better than I thought it would. I’d have to say that the combination of bacon and ice-cream just doesn’t do it for me…just the idea of the two turned my stomach…and I generally like everything. So, yes, I agree with Kate and say thanks….now I know. Tasted fatty! Oh that is wrong! Thanx Matt. I too now know! Your culinary tastes are hilarious Matt! Can’t wait till you get to Iceland!! Maybe you just needed a fine red wine with that? Or perhaps not. High fives for the paper. That Bacon Sundae looks amazing, Maybe your taste buds have been suffering and are some how out of whack. First a bison burger that doesn’t taste like it should, and then a sundae that doesn’t taste right in the same blog entry. It’s clearly a user issue and not the bacon sundae’s fault.